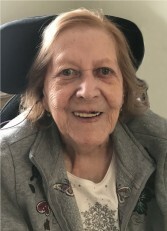 Peacefully at Golden Plough Lodge, Cobourg, surrounded by her family, on Monday, April 8, 2019, in her 86th year. Beloved wife of the late George. Loving mother of George, Werner (Elfriede), Michael (Kathy), Herbert (Sharon) and Sonja Yeomans (Erick). Cherished grandmother of Andreas, Dawn, Annelise, Thea, Daniel and Desaree. Dear great grandmother of Brennan, Arion and Josefine. The family would like to thank the staff at Golden Plough Lodge for their great care of Josefine. A celebration of Josefine’s life will take place on Sunday, April 28, 2019 in the MacCoubrey Funeral Home Reception Centre, Cobourg, from 1 – 3 p.m. with memories being shared at 2 p.m. Donations to the charity of your choice would be appreciated by the family. Condolences received at www.MacCoubrey.com.